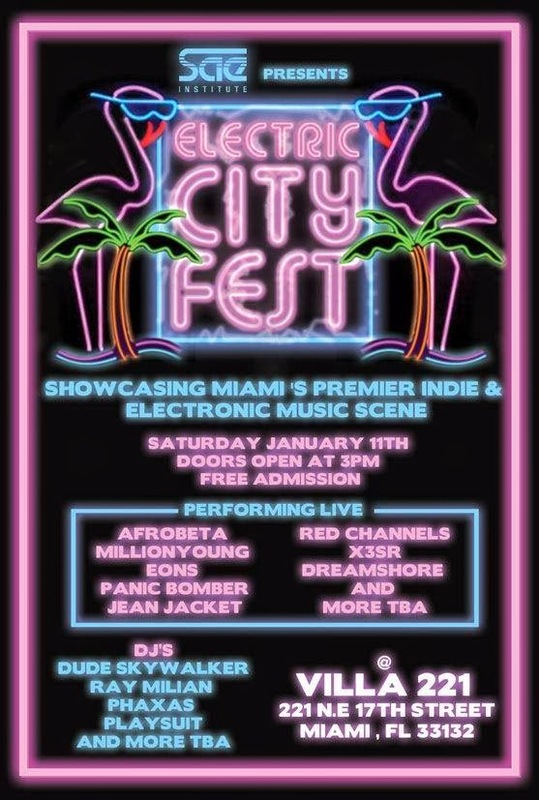 This coming Saturday, January 11th for Miami's monthly art walk shindig there's a very special daytime outdoor event being held at Villa 221 and being put together by Eons founder Johnny and SAE Institute called Electric City Fest. It features a wide range of South Florida indie and electronic acts; from Afrobeta to Millionyoung, Panic Bomber, Jean Jacket, Eons and many more. In addition to the live acts there will also be DJ Sets from local spinsters (including yours truly) in between the bands sets. The event runs from 3PM until 11PM and the best part is it will cost you nada! That's right it's a free event! Hard to catch so many of these fine South Florida acts all under one roof (or sky in this case), especially for free. Gonna be a hoot!